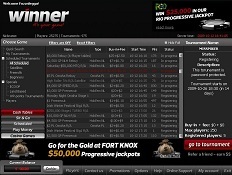 With no more than two years since its launch, Winner Poker (www.Winner.com) has reached where few sites would have in such a short duration. Launched in 2009, Winner poker has already earned a place in the list of the top 10 poker websites in operation. Winner poker is part of the iPoker network and features all the classic poker games with amazing graphics and cutting edge technology. The site has been received with great reviews ever since its launch and has ranked high on all aspects. The welcome bonus offered at Winner Poker is one of the most attractive features of the site. New players at the site are given a 250% bonus of the first deposit, going up to $1,000. Players will have the bonus money transferred to their accounts in transactions of $10 each. To get the $10 transferred to the account, players have to earn a certain number of comp points. Along with the bonus, the first deposit also entitles players to enter the daily free roll and the weekly depositors’ free roll games. Ready to Join! Use our Winner Poker coupon code TOPBONUS on signup and receive your 250% poker bonus today! Visit Winner Poker here! The Bad Beat Bonus is yet another interesting bonus offer from Winner Poker, where a player who loses by a close margin is given $250 as a compensatory bonus. The site also offers a bonus amount of $150 for every friend invited to the online poker room via the refer-a-friend poker plan. Playtech, one of the leading names in the gaming software development industry and member of the iPoker network has designed the software for winner Poker. Most poker sites that are members of the iPoker network are known for the minimalist style they employ in their designs and the same is true with Winner Poker. That, however, is not to say that the graphics at Winner Poker are dull and unattractive. In fact, the software at the site mixes functionality and visual appeal quite effectively. A customizable table felt and a 4-color deck are some of the features of Winner Poker’s software. The software allows for multi table playing, where a player can play at 16 tables at the same time with no noticeable change in performance. The software is available both in the downloadable version, which is for users of Windows OS, and the non downloadable instant play version for the convenience of Linux and Mac users. Winner Poker features all time favorite poker games like Texas Holdem Poker, Omaha Hi Poker, Omaha Hi-Lo Poker, 5 Card Stud and 7 Card Stud. The games can be played in brilliant quality with superb graphics and a sleek looking visual design. For a poker site that is only two years old, the range of promotions offered is simply awesome. Right now there is a discount offer of 75% on buy-ins for Guaranteed Tournaments. Another tournament is the Step tournament, consisting largely of 10 player Sit ‘n go games at varying buy-in levels. The Asian poker tournament is another high stakes tournament. There are also free roll tournaments and all these tournaments give players a chance to win money in the thousands. The Guaranteeds are worth $200,000, the Asian Poker tournament is worth almost $40,000 and so on. Other tournaments at Winner Poker include various jackpots like the Fort Knox, Rio, Maui and Dirty Dozen Jackpot. Tournaments are available every day of the week and at different times of the day. Even if a player fails to get into a tournament, he/she can always get into another tournament which is likely to begin a few minutes later. 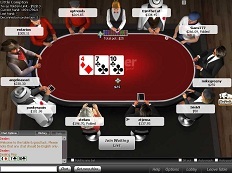 Winner Poker has chosen some of the most trusted names in online banking. A number of options are available for players to make their deposit and withdrawals from the site. They include Visa, MasterCard, Visa Electron,UsemyBank, Webmoney, giropay, iDeal, Bank Transfer, Entropay, Paysafecard, Ukash, Click2Pay, ClickandBuy, Neteller and other e-wallets. Another convenient option of making deposits is through bank transfer. One of the unique features of the banking facility here is that transfers can be done in any currency, which is then converted into the currency accepted by the site. Through other methods, Winner Poker accepts payments in three currencies- Euro, pound sterling and US dollars. Plans to multiple currencies through all these mediums are still on at the site. As of now, ₤/€/$ 20 is the minimum amount accepted as deposit at the online poker room. The customer support offered at Winner Poker is of the highest quality that can be expected from a poker room. The customer service centre operates 24/7 a week, and can be contacted by live chat, email, fax and telephone. An even more impressive fact about the customer service at the site is that service is provided in a number of languages including English, Danish, Swedish, Dutch, Spanish, German, French etc. At the FAQ section players can find solutions to most of the problems that can be faced while using the site. The security features at Winner Poker are also of a very high standard. State of the art equipment, like SSL encryption (128-bit) has been installed by the site, ensuring that personal data of the players remain safe and free from hacking. With the services provided, it is hardly surprising that Winner Poker made it to the top 10 list for most people in no time at all. This remarkable new poker site has scored in all departments, ranging from games and software to customer support and security. Cashier's Check, Money Order, Banker's Draft, Personal Check, Bank Wire Transfers, NETeller, PayPal. All of the deposit and withdrawal options are only available to non-American players. Ready to play at Winner Poker. Use our Winner Poker coupon code TOPBONUS when you join and you'll receive a huge 250% bonus up to $2000. Winner Poker is not open for USA players.